Groundwood/Douglas & McIntyre, 1988. 0-88899-073-1. Good clean lines and architectural shapes and their interplay are important in this book and Ian employs them everywhere from the shape of the page (square) to the landscape of the town. Squares, rectangles, triangles and circles are everywhere and that's good because David Finebloom needs them. David has received a message from outer space. "Help! I'm falling apart. Yours, the Moon," it says. David is brave and David can build with blocks. He sets out in his spaceship. The moon has almost disappeared. Slowly but surely David puts a block here and another block there, and the moon, like a huge jigsaw puzzle, returns as glorious and as full as ever. Well, maybe it's a little rough in places but no one on earth will notice. The job all done, David returns home just in time for breakfast. 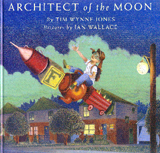 Using varying perspectives, Ian recreates the sense of dizzying heights in this story about a daring young girl. Each morning just as the rooster crows, Morgan climbs up to the top of the barn and walks across the roof's thin tin peak. Then she stands on her hands. Yellow from the rising sun shimmers on the blue and green landscape of Morgan's pastoral world. One day her dad catches Morgan on the roof and he tells her to get down immediately. Morgan secretly practises on the highest beam in the barn instead. The circus has come to town! In one of the circus tents, Morgan discovers Amazing Anastasia's costume and leather shoes. Without thinking, she puts them on. 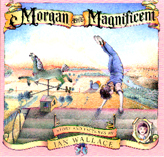 Following the elephants into the big top, Morgan sees the highwire. Up she climbs and steps on to the wire. Looking down, she suddenly loses her confidence. The Amazing Anastasia appears at the platform and coaches Morgan back to safety. The crowd, including her dad, cheers. When the circus leaves town, Anastasia hands Morgan a present -- a pair of leather shoes -- to "Morgan the Magnificent"! When Katie's brother Charles kills a mother sparrow one spring day, Katie rescues the sparrow's baby. She takes it to the most magical place she knows - Niagara Falls! As the little bird grows, Charles is sorry for his actions. Decked out in leaves and branches, leaping and flying near the Falls together brother and sister teach the bird to fly. Eventually the little sparrow flies away, and as summer draws to a close, the children wonder if the sparrow is safe. One autumn day, they hear its sweet song and find the sparrow singing happily in their tree. The children inhabit a verdant world, lush and natural, in an innocent time and place that is long past. Ian uses a rich and bright palette of coulours; each page is alive with a dozen variations of green. His bold double-page illustration of the children teaching the bird to fly is a joyful tribute to nature and all its wonders. 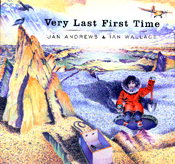 Written by Jan Andrews, illustrated by Ian Wallace. Eva lives in the north, where it is cold and icy for much of the year. As the sea freezes and turns to hard, thick ice, the people of her village harvest mussels at the bottom of the sea. Eva's day to walk alone under the frozen sea has come. Through a hole in the ice Eva goes down, her feet touching the soft sea bed. Around her the smell and sounds of the undersea world envelope her. She gathers mussels, quickly filling her pail. Now Eva has time to explore. There is so much to see. But the tide is coming in and Eva's candle has gone out. With courage and strength Eva finds her way to safety, the ice hole, the moonlight and her mother. Eva's journey at the bottom of the sea is full of mystery and quiet discovery. Likewise Ian's water colours have embedded in them hidden images of animals and people that are an integral part of Eva's Inuit culture and lore. Like Eva, the reader is invited to uncover and see behind the pictures and to share in Eva's spiritual experience.